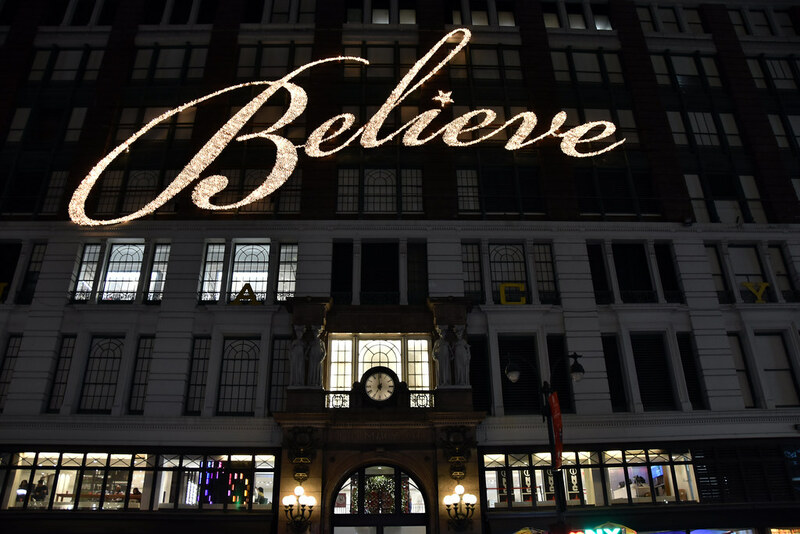 For my 4th Blogmas post, I thought it would be cool and fun to share with you guys some things that I think are really great to do and see during this time of year around New York City. I’ve lived in New York ALL my life, and I can honestly say that the city is such a magical place to be in during the holidays. Personally, all of the shows, attractions, etc. never get old (it could just be because I’m a Christmas fanatic in every sense of the name, but that’s completely besides the point haha). These aren’t going to be in any particular order because, well, when do I ever put things in a particular order? And, I literally love going to do and see EVERYTHING that I’m going to mention, so there’s no way for me to order them in any specific way haha. But anyway, let’s get started! Radio City Christmas Spectacular starring the Radio City Rockettes (In Radio City Music Hall). Diego and I actually just took his mom and nephews to see this show this past weekend. It was their first time seeing it, and our 3rd. It’s quickly become a mini holiday tradition of ours to go every year. This is something that I recommend for EVERYONE (whether you live in NY or are just temporarily visiting) to go see at least ONCE. It’s such an amazing show filled with skits, Christmas music and just generally a great time. It runs for about 90 minutes, and is a great show to go see with a significant other, family, your kids, friends, etc. Scroll down to see some pictures from the show. For this show, I suggest using the TodayTix app because they tend to have pretty good (and sometimes cheap) ticket options. This is another great attraction to do with family, friends and/or a significant other. If you’re not from New York, this specific attraction is actually in the Bronx, but 100% worth making the trip to. I took my family and Diego to see this for the first time (it was also my first time), last year right before Christmas. I wanna say that it’s been open for about 2 years now, because I remember when it first opened in 2016 it was SO popular that it was next to impossible to get tickets for it. Every single day from the time it opened until it closed for the season was completely sold out. So, last year I jumped at the opportunity to grab some tickets, and we all loved it. The way everything was set up from the trains themselves, to the mini set ups for each section, it is SO well put together. 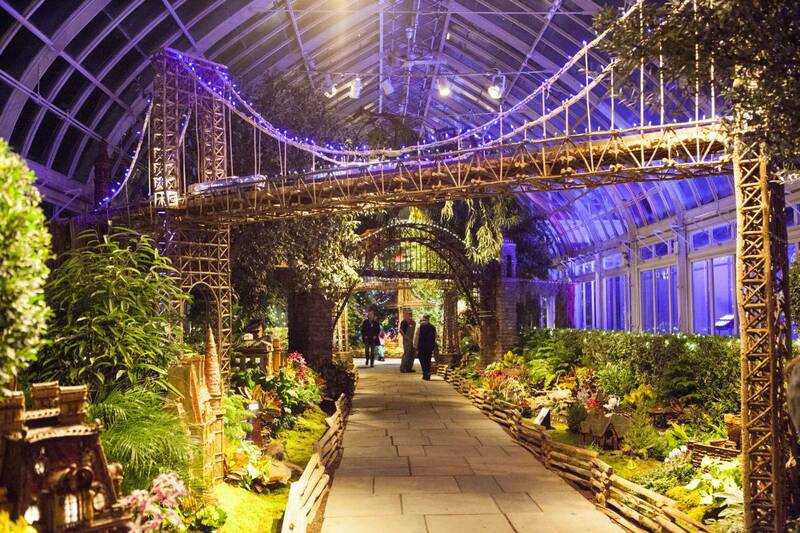 Plus, if you buy tickets for the train show, it also automatically allows you the opportunity to be able to walk around the garden a bit afterwards which, in itself, is beautiful as well! I’m leaving the link here in case you guys wanted to buy some tickets for this! 3. 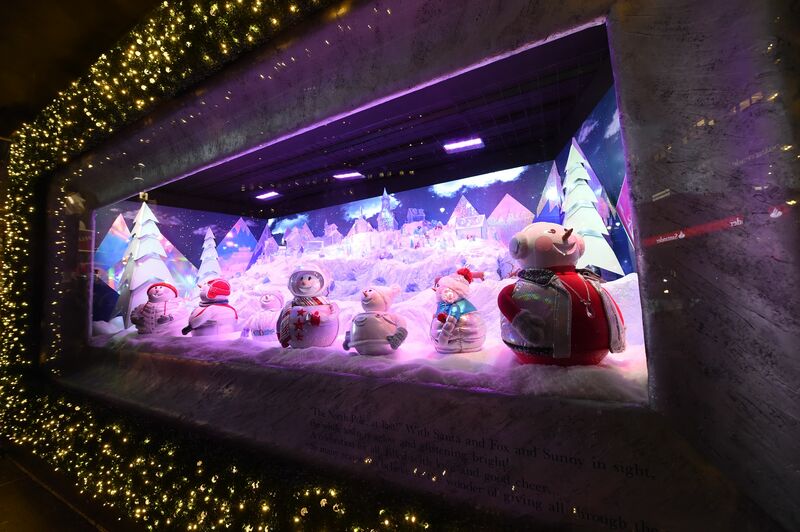 Holiday window display(s) and other holiday attractions around the city. 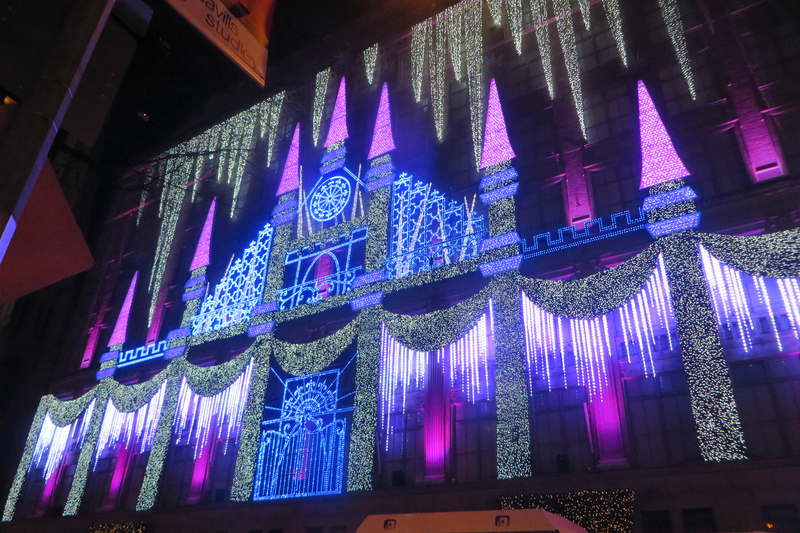 When you’re in the city during the holidays, it’s almost impossible for you to somehow miss all of the decor, window displays and attractions, just because a lot of them just happen to be all around each other. 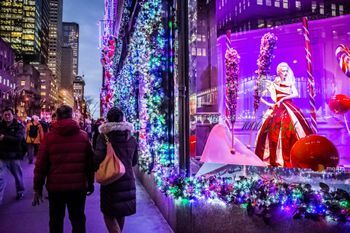 Some places in particular I recommend walking through/by are 5th and 6th avenue, just because you’ll easily be passing a lot of the “main” holiday attractions like from Saks 5th Avenue, Barneys, Lord and Taylor, Rockefeller Center, Radio City Music Hall, etc. Plus, all of these places (although they do get pretty busy and packed), are GREAT for videos and pictures of these things if you’re into that for memories sake. Radio City Music Hall and surrounding holiday attractions/decor. Ice-skating is definitely a go-to thing to do while you’re in the city. 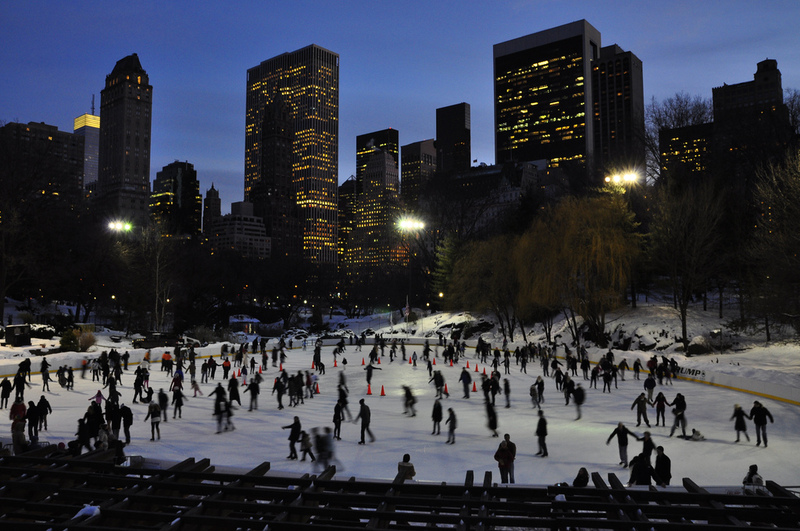 Obviously other cities and places have ice-skating as well, but what better then being able to do it in some of the most popular places in New York like Bryant Park, Central Park or even Rockefeller Center?! Plus, this is a perfect little date night to have with your significant other. Super cute and romantic, and these are definitely other great spots to be able to take cute and memorable pictures. Central Park (although they have 2 different ice skating rinks here, one called Lasker and one called Wollman’s rink, the one pictured is Wollman rink). 5. See and buy stuff from the holiday markets around the city (i.e., Bryant Park and Union Square (14th St.) holiday markets). This sort of piggybacks off the ice-skating suggestion just because, right outside of the ice-skating rink at Bryant Park, they have these little holiday market shops where you can buy all sorts of things from snacks, to clothing, jewelry, etc. They are the PERFECT little shops to stop at before heading home for the night, especially if you happen to be doing any last minute Christmas shopping for people. 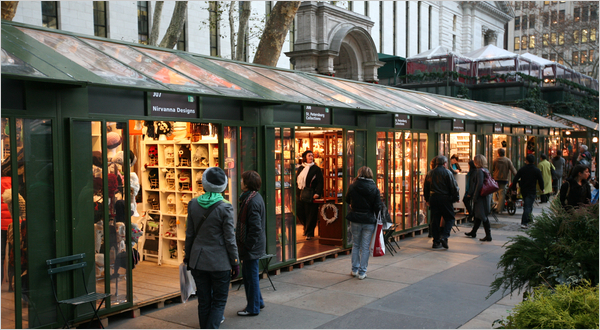 They also have mini holiday shops/stands like this in 14th Street, Union Square if you happen to be in that area instead of around Bryant Park. And finally I want to suggest the Cocoa & Carols holiday cruise. Personally, I think this would be the CUTEST little date to take your significant other on. It’s super chill, not that expensive, and also pretty romantic. HOWEVER, this little excursion is also just as good for family and friends as well (it’s what you end up making of it). The entire cruise itself goes on for about an hour and a half, and when you buy a ticket, it comes with a complimentary beer, glass of wine, champagne or (the more obvious one), hot cocoa! There are also cookies and other sweets that are included as well. You get to hear and sing along to Christmas songs, and you’ll end up seeing a TON of some of the most popular attractions/sights of New York like the Statue of Liberty, Ellis Island, Battery Park, South Street Seaport, etc. The link for Goldstar I’ll leave here for you to easily access. And the one for Groupon, I’ll leave here . I hope you guys enjoyed this post, and that whether you’re already from New York, or just visiting, that this helped you in some way, shape or form to narrow down some of the (best) things to do/see in Manhattan while you’re there during the holiday season. It can definitely be a little crazy here during this time of the year, but I think it’s definitely worth the wait and trip.